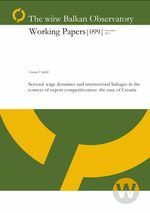 This study explores the determinants of sectoral wage dynamics in Croatia, including intersectoral wage linkages. Wage formation in the exporting sectors receives particular focus. Exporters are found to be wage leaders and labor productivity is a more important wage determinant for exporting than for other sectors. There are wage spillovers within a group of exporting sectors and possibly a bi-directional relationship between wages in exporting and private sheltered sectors. Thus, some exporting industries may face pressure from wage increases in more successful exporting and in private sheltered sectors. A more coordinated wage setting system could contribute to easing this pressure and improving overall export competitiveness.